Skeptical Science - debunking climate science myths and giving you the facts with explanations in either simple or technical language. Australian Bureau of Meteorology's Climate Information website - providing you with the latest climate information and data for Australia, including seasonal outlooks and historical data. KNMI Climate Explorer - a handy online tool for do simple analyses of global climate data from observational, reanalysis and model data sets. I have contributed to print, radio, TV and social media as an expert commentator on climate variability and climate change, particularly with relation to extreme weather. In 2016, I became a regular host of Melbourne radio station 3RRR's Einstein-A-Go-Go. I have appeared multiple times on ABC's Radio National as well as ABC local radio around Australia. I have also written many articles to the online expert commentary site The Conversation, which are listed below. I featured in ABC television's Hungry Beast filmed a satirical music video called "I'm A Climate Scientist" (aired May 2011). For media enquires please contact Alvin Stone at the ARC Centre of Excellence for Climate Systems Science or Claire Bowers at the Faculty of Science media office at Monash University. In 2015, I received a Victorian Young Tall Poppy Award for excellence in science and science communication. In 2014, I was involved in the Australian Academy of Science (AAS) Theo Murphy High Flyers Think Tank on 'Climate Change Challenges to Health'. The Think Tank brings together early and mid-career researchers from many different disciplines to try address topics of national significance. A report from this Think Tank is currently being prepared by the AAS. 'Is this how you feel' is a science communication project by ANU Masters student Joe Duggan. Joe has asked scientists to pen letters about how they feel about anthropogenic climate change. So far, 34 climate scientists from around the world have provided letters. You can read mine here. This science communication project came off the back of a paper published by John Cook at the University of Queensland. The paper described that 97% of the peer-reviewed scientific literature "endorsed the position that humans are causing global warming". 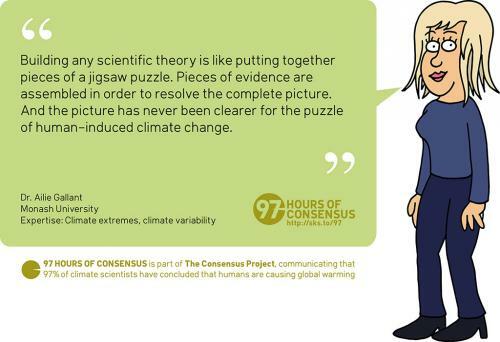 Every hour, for 97 hours, the communication project tweeted a caricature of a climate scientist from around the world and included a quote on their professional, scientific view on the cause of present-day global warming. The project got a lot of traction on social media, largely helped by a retweet from US President Barak Obama. I have given several talks to the general public and interested community groups. I was invited to be an expert panellist for a public forum on the 'State of the Climate', coinciding with the release of a major report by the Bureau of Meteorology and CSIRO. This talk, at the State Library of Victoria, was attended by over 250 members of the general public. I have participated in many school visits, from primary through to high school level. Talks have included topics on extreme weather, human-induced climate change and the impacts of climate change on the Australian environment. In 2013-2014 I was an expert panel member of the Victorian Certificate of Education (VCE) Environmental Science Review.